Today I had the chance to perform a quick research about a classic problem. If have different settings for development, testing, staging and production. So, we usually merge or lost settings of the configuration files. 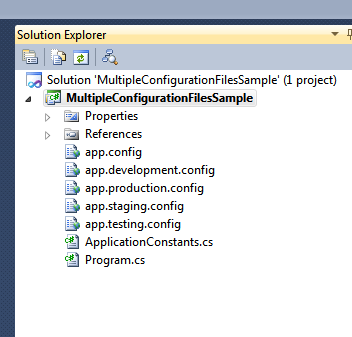 Visual Studio 2008 have already resolved the problem (at least in web applications) by allowing the user to create different web.config files and applying XSLT to generate the final configuration file. Today I’ll propose the same solution, but for desktop Apps, and hopefully you could apply this solution to any XML file. We have a configuration file ( .config or any xml document), and we want to have different settings per environment (development, testing, staging and production). Moreover we want to automate this process, so we don’t have to write the settings manually. It’s good to know basics of MSBuild and how to modify project. Let’s start by creating configuration settings for each environment where you need custom settings. You could do it by click on “Configuration Manager…“. For example I’ve created the environments that we’re gonna use on this example. Now you will have to edit the project file using a text editor. VS project files are XML, these normally are read by VS and see the project structure. However there are tasks that only can be customized by editing manually the XML file. You can modify the xml of a project within Visual Studio by using right (secondary) click on the project from the Solution Explorer. Then, click on “Unload project”, and once again right click and now select “Edit project …”. Now, you should be able to see the XML associated to the selected project. The previous XML portion Adds a custom task called and it uses MSBuild variables to determine the name of the configuration file, our example is using a Console App, thus we need to create a copy of the config file but with vshost.config extension, so we added a copy task. The second thing we’ve added is a call to the task we’ve just created, this call is added into the AfterBuild Target. The AfterBuild is invoked by MSBuild automatically when the build process has finished. To put it in a nutshell, our XSLT is detecting specifically three attributes (by its name and location into the XML) and replacing them with a custom value. All the remaining nodes are kept into the final XML. Just to make it work I’ve coded two classes, one that defines the constant name of the settings and a main class which print values from the configuration file. 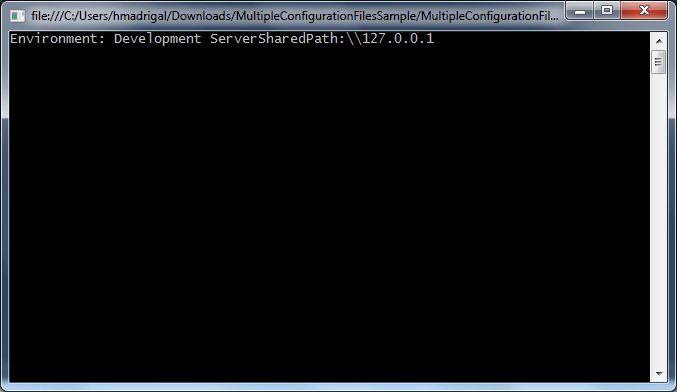 As you can see, the selected environment is determining the settings into the resultant configuration file. Long time ago I wrote my approach of how to write a plugin (add in) using Microsoft Unity (http://unity.codeplex.com/). In my old approach (https://hmadrigal.wordpress.com/2010/03/28/writing-a-plug-in/) was using the unity.config file to load dynamically the plugins. Certainly the major issue with this approach it’s that you will have to update your unity.config file every time you add a new plugin. https://github.com/hmadrigal/playground-dotnet/tree/master/MsDotNet.PluginWithMEF The code runs in MonoDevelop as well as in Visual Studio. On this post I’ll explain how to easily use Microsoft Extensibility Framework (MEF) http://msdn.microsoft.com/en-us/library/dd460648.aspx to load plugins from a directory. Additionally MEF is a framework to create plugins and extensible applications, so it supports more operations other than loading types from external assemblies. I want to load different language implementations provided in different assemblies. So, each DLL might (or might not) contain an implementation of a supported language. Moreover, the assemblies can be implemented by third party members, so I cannot binding them into my project at compile time. Define a common contract in order to identify a class which provided a supported language. Moreover all the “extensible” portion of your application should be encapsulated into a simple assembly that could be redistributed to other developers who wants to implement the plugin. BTW, when implementing plug ins, it’s normal to define a contract (or interface) which defines the required functionality.I’ll be using the word “part” when I’m talking about contract or interfaces. The project MefAddIns.Extensibility defines an interface which can be used to provide a supported language. /// Provides an implementation of a supported language by implementing ISupportedLanguage. /// Moreover it uses Export attribute to make it available thru MEF framework. Please note that the attribute Export indicates to MEF framework that the class EnglishLanguage can be used when a ISupportedLanguage is requested. In other words, if any other application is looking for a part ISupportedLanguage then MEF framework will suggest EnglishLanguage. In further steps we are going to create a MEF catalog which is the mechanism to associate exported parts with the members which need to import parts. Part: It’s the portion of our code that can be exported or imported. Export: It’s the fact of indicating that a portion of our code is available and it fits a set of traits. E.g. EnglishLanguage implements the ISupportedLanguage Interface, thus I can add the attribute Export(typeof(ISupportedLanguage)). Import: It’s the fact of indicating that a portion of our code requires a part that fits a set of traits. E.g. I need to import a give language, then I define a property of ISupportedLanguage type and set the attribute Import(typeof(ISupportedLanguage)). Catalog: It a source of Exports and Import definitions. It could be the current execution context or a set of binaries files (such as dlls, exes). Container: It’s an module which deals with class instantiation. This item uses the catalog when needed in order to create the instances during the composition process. Composition: It’s the fact of taking an object and making sure that all its needs regarding imports are fulfilled. Certainly this will depends on the catalogs and the export and imports that are being used on the catalog. //Adds all the parts found in same directory where the application is running! Hey It’s not printing anything!!! Ok. There is an additional thing to talk, which it’s not strictly related to MEF. As your might noticed our sample application does not have references to any of the MefAddIns.Language. * Dlls but it’s running code from them. Here is the deal, since our application uses MEF we don’t need to reference directly these DLLS, we just need to copy them into the directory where the DirectoryCatalog is going to look for them. The code sample looks into the directory where the application is running, so we have configured our main csproj to copy the DLLS to the output directory of our main application. 1) Add the external DLLs into your project. First, Right click on your main project, and click on “Add existing item…”. Look for the DLL, and select “Add as a Link”. The configure the properties of the added file to copy always or copy when newer. 2) Update the csproj file. Right click on your project, and the select “Unload project”. Then once again right click on your project and select “Edit xxxxx.csproj”. This will open the project as an XML file. Look for the added DLL, and replace part of portions of the path for MSBuild variables such as $(Configuration). Note that there are more options to do this, such as using the Copy task from MSBuild (see http://stackoverflow.com/questions/266888/msbuild-copy-output-from-another-project-into-the-output-of-the-current-project ). In our sample this was enough because we are looking for DLLs into the current directory, but depending on your file structure this won’t be recommended. At last comment, this is the most basic sample of using MEF to create a plugin-based structure. There are more things to consider , e.g. the path where your DLLs are going to be placed or how your main application is going to exchange information with the plugins. MEF has also more options to create extensible applications. Also, it’s important to consider when it’s good to create plugin based architectures rather that tightly coupled apps.